On your local Chevy Dealer's bookshelf when your Corvette was new! This is original manual the local Chevrolet service department used to service your Corvette when it was "new". These official publications provide maintenance and repair information which is not covered in other Chevrolet (Passenger Car) Shop Manuals. 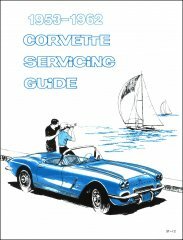 This guide provides sufficient information to enable Chevrolet technicians to perform any maintenance the Corvette may require and will also assist the less experienced person in performing occasional service on his Corvette. Only Chevrolet approved service procedures, for purposes of maintaining design standards, are outlined (according to the manual's Foreword). You will want to purchase the appropriate Chevrolet Passenger Car Shop Manual listed elsewhere in our online store for COMPLETE coverage of yourCorvette! Softbound, 8 1/2 x 11 and 200+ pages.